PYONGYANG/SEOUL - From carrot-flavored toothpaste and charcoal face masks to motorcycles and solar panels, visitors to North Korea say they are seeing more and more locally made products in the isolated country’s shops and supermarkets, replacing mostly Chinese imports. As the Trump administration considers tougher economic sanctions to push the isolated country toward dismantling its weapons programs, North Korea is pursuing a dual strategy of developing both its military and economy. The majority of consumer products in North Korea still come from China. But under leader Kim Jong Un, there’s been an attempt to sell more domestically made goods, to avoid any outflow of currency and to reinforce the national ideology of “juche,” or self-reliance, visiting businessmen say. There is no available data to show how much is being produced domestically. Export data from countries like China and Malaysia, which sell consumer goods to North Korea, may not be an accurate reflection. China’s Commerce Ministry declined to comment when asked whether China’s exports to North Korea were decreasing due to an increase in locally made products. Visitors say that with the impetus from the top, large North Korean companies like military-controlled Air Koryo, the operator of the national airline, and the Naegohyang conglomerate have diversified into manufacturing consumer goods, including cigarettes and sports clothing. 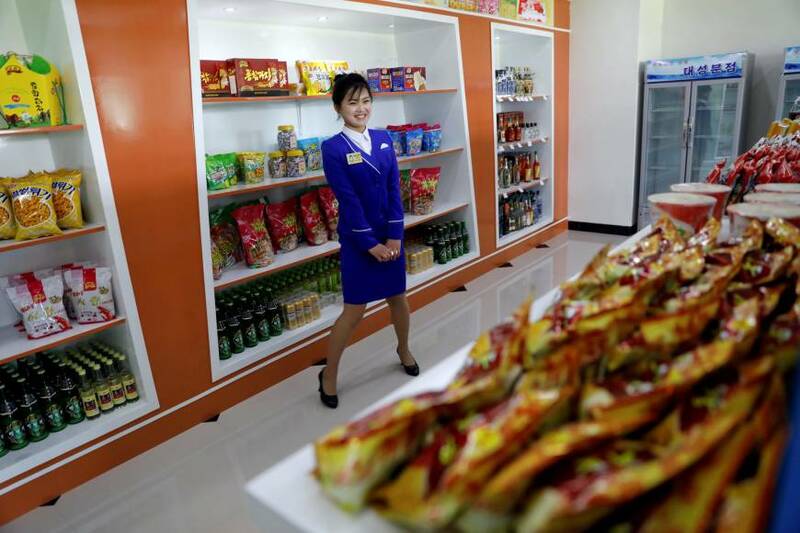 A Reuters team that was in the capital Pyongyang last month was allowed to go to a grocery store, accompanied by government minders, where shelves were filled with locally made drinks, biscuits and other basic food items. Other visitors have seen locally made canned goods, coffee, liquor, toothpaste, cosmetics, soap, bicycles and other goods on sale in the city. “As new factories open, the branding, packaging and ingredients of our food products have improved,” said shop assistant Rhee Kyong Sook, 33. Visitors say locally made consumer goods are becoming increasingly sophisticated and QR or matrix barcodes can been found on a wide range of products from makeup to soft drinks. Market vendors are also becoming more competitive, offering samples of their food to shoppers, something they didn’t do five years ago. 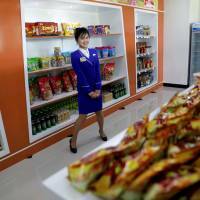 Air Koryo’s range of products now includes cigarettes, fizzy drinks, taxis and gas stations. “Naegohyang,” or “My Homeland,” began as a Pyongyang-based tobacco factory, but has expanded in recent years to produce playing cards, electronic goods and sports clothing. The company even sponsors a women’s football team of the same name. The North Korean companies were not available for comment and do not publish revenue or profit statements. It was not possible to identify any joint venture partners. Traders and retail experts said the North Korean market was attractive, thanks to a growing class of “donju,” or “masters of money,” who generate wealth in a gray market economy that is being increasingly recognized and controlled by the state. For example, while domestically made instant coffee is becoming increasingly common, the sugar used in it would likely come from China or another country that produces sugar and pass into North Korea via China, said Abrahamian. Diplomats said last week that Washington was negotiating with China on a possible stronger U.N. Security Council response — such as new sanctions — to North Korea’s missile launches. “If you have a coal mining town of 10,000 people who are all in some way connected to the coal industry, then when sanctions are imposed against North Korean coal, the whole town’s consumer market will suffer because people don’t have the buying power anymore,” said Abrahamian.